Raise your hand if you’re in the #easylifewithdishwashers team… I for sure am! As someone who is an absolute foodie, loves to cook and entertain, cleaning up after a hearty meal can sometimes be a challenge. I’d have to admit that (unlike a lot of women) I don’t mind doing dishes and I also don’t fear that my house-help will break my expensive china (thank heavens for how careful she is! ), but somehow when I’m placing everything back where it goes, I often wonder if the utensils could have been washed better. Having said that, there have been countless instances where I have had guests at home and my trusty house-help goes missing for days at an end (we’ve all been there, right?!). 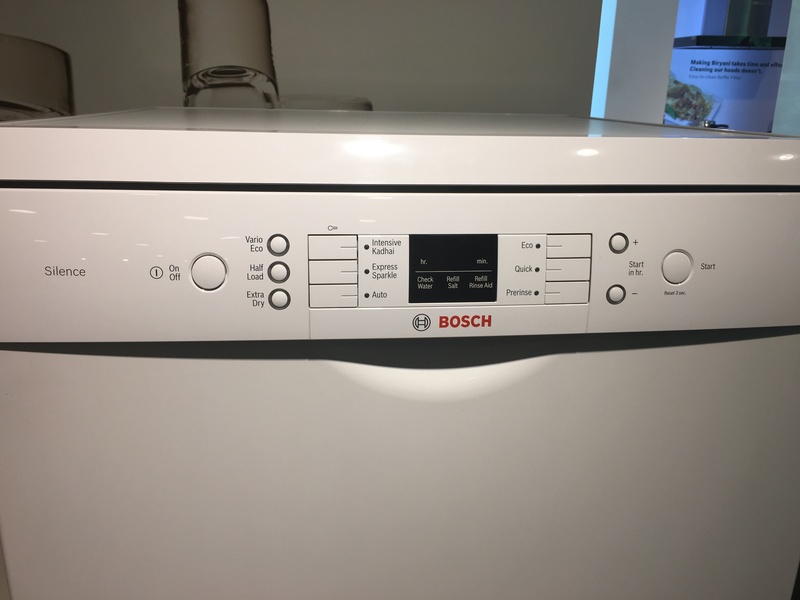 Long story short, we wanted to make life simpler and recently decided to look into dishwashers, which is how I ended up at the Bosch Home Appliances office earlier this week. 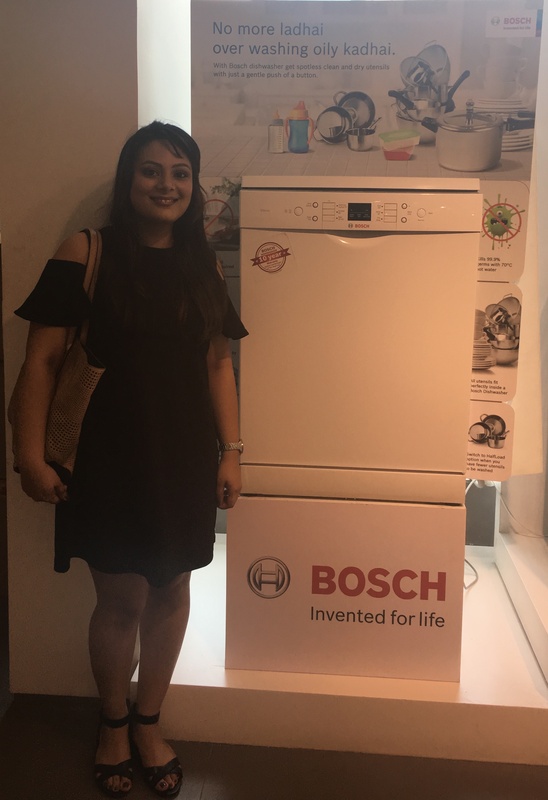 On my visit there I learned a lot of things that I’ll be talking in detail about, but what stood out to me was that Bosch promises to make your life easy with their products and so their dishwashers give you spotless and dry utensils in the smartest, quickest and most efficient way possible. These dishwashers are fully integrated and designed to fit seamlessly into your kitchen. Bosch says that these can either be placed behind a tall cupboard or can even be built in or fit under a kitchen counter. This particular version is perfect for those who like more clean, modern-style kitchens. Another wonderful thing about these is that the working height for the dishwashers is such that it’s easy on your back. 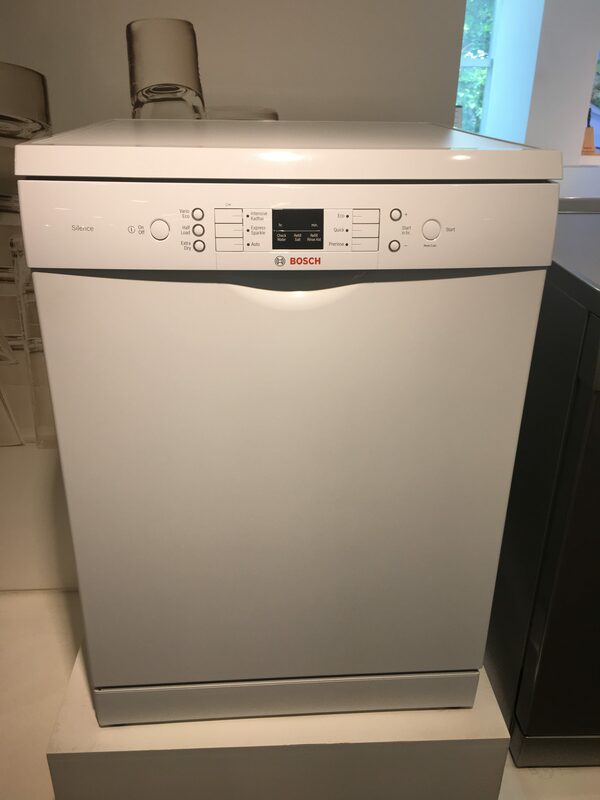 The more popular of the two, freestanding dishwashers are easy to install and also move around when compared to their integrated counterpart. This is the version that peeked my interest, because as someone who is currently renting an apartment, this would be the perfect choice keeping in mind that we will be moving house some day. With this version, the front door is visible and they also come in different colours and price ranges- so there’s something for everyone here depending on your taste, budget and home. Ok so now let’s talk in detail about the freestanding dishwashers I’m reviewing today. Like I mentioned earlier, the fact that this dishwasher is easier to install and move around is what made this the perfect choice for us. 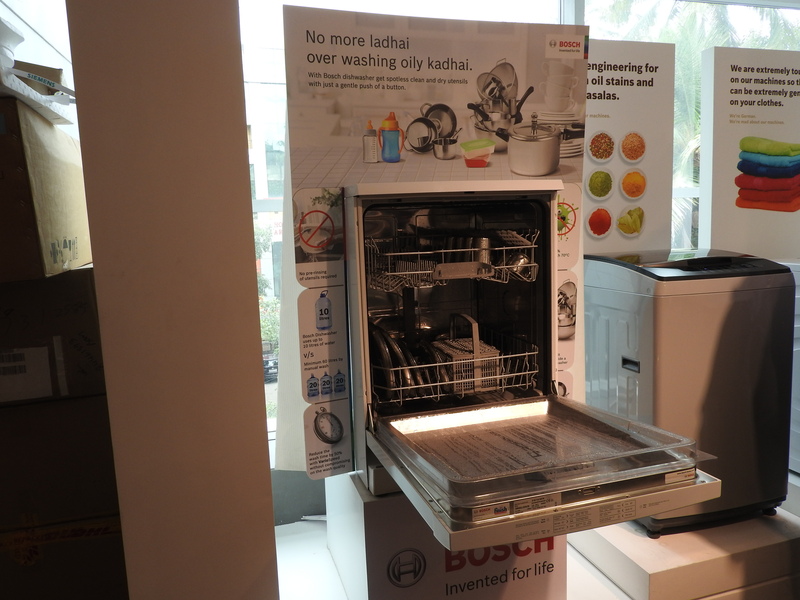 I also learned that Bosch has paid close attention to how Indian cooking is done- so oily and greasy utensils that are coated with tadka and masalas also come out sparkling clean – they’ve got you covered! There are different programmes to choose from, so all your utensils – be that delicate china or microwave plastic or even stainless steel for that matter can be washed easily and hassle free. Scrape the leftovers from the utensils and directly place them in the dishwasher. There is no need to pre-rinse utensils. The only thing to keep in mind is that you need to place big pans/kadai/pressure cooker facing down. 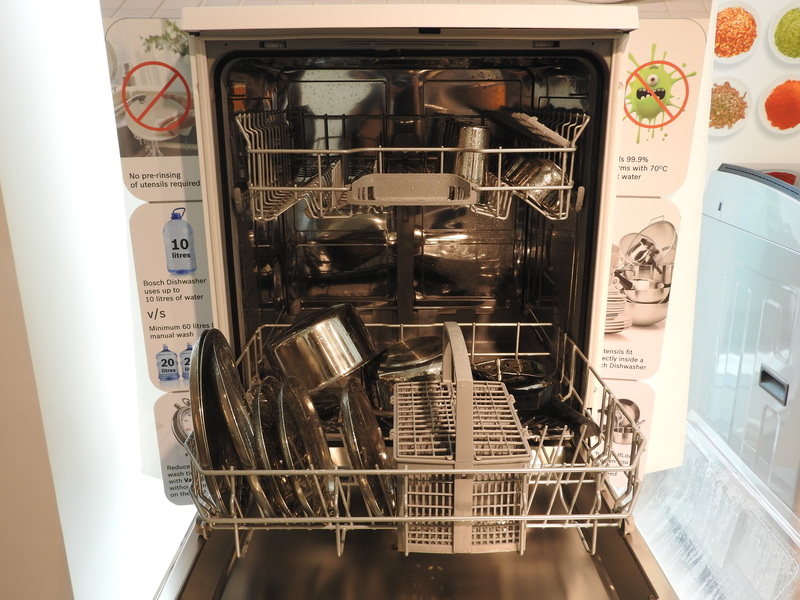 The dishwasher has two baskets that are large enough to hold any type of utensils. There is space for plates, pans, cups, glasses, etc. There’s also a separate basket to place cutlery in. 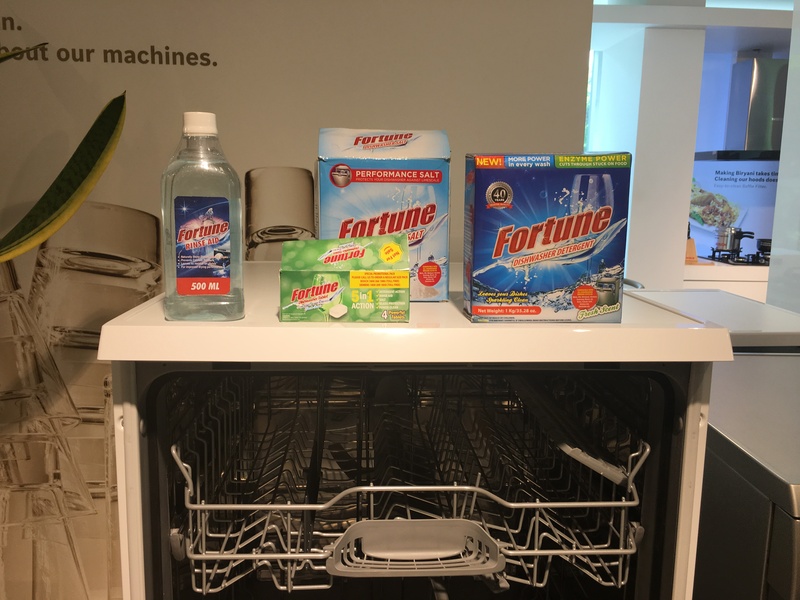 Once you have loaded the dishwasher, all you need to do is choose a wash option/setting and add in the detergent, salt and rinse aid and voila, your job is done…before you know the dishwasher will have washed your utensils and dried them for you as well! Pre-activated VarioSpeed reduces wash cycle time without compromising on wash results. Express Sparkle gets your dishes and cutlery clean and dry in under an hour. Intensive Kadhai 70°: special programme for heavily soiled Kadhais, Pots and Pans with intensive washing and drying cycles – for optimal cleaning and drying results. Hassle-free washing. Be that by you or your house-help. Yes, operating is so easy and simple on this machine that even your maid can easily use it. LoadSensor feature. An efficient wash system that saves both water as well as electricity. The rotary speed sensors in the dishwasher detect the load size for every wash and use only as much water as needed to wash that load. So let’s say the water tank capacity of the dishwasher is 12 litres, but your wash load requires only 9 litres of water – the dishwasher will only use 9 litres and save the extra 3 litres in the reserve tank for the next time you wash utensils. Genius!!! HalfLoad option. So if you think a dishwasher only makes sense if you have lots of utensils, no…you’re mistaken. 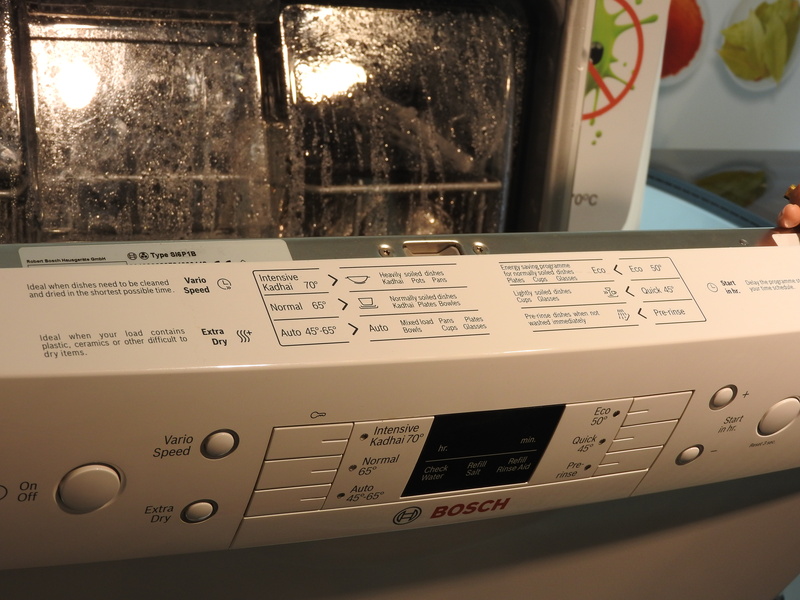 Bosch has you covered and is giving you the option for half load functioning. Use this setting when you have lesser utensils to wash. Intensive Kadhai 70° and Extra Dry option. I personally love the idea of having utensils being washed with hot water and then coming out absolutely sanitised and dry! I’m sure you’ve figured out that I was completely sold and I hope I’ve convinced you to look into the Bosch dishwashers too! Before I end, I’m sure you are all wondering how the dishwashers are priced. Well, the Free-standing Dishwasher starts at Rs. 37,500/ – whereas the Built-in Dishwasher starts at Rs. 50,000/- . If you ask me, I think that’s very reasonable considering it is a one-time investment that’s going to change your life….for the better!